CADE Estate is a relatively new estate. The winery was founded in 2005 when three partners, Gordon Getty, Gavin Newsom and John Conover purchased vineyards located on high up on Howell Mountain, just a bit northeast of St. Helena. The name CADE makes sense when you know its origin, which is Shakespearean in nature. William Shakespeare used the archaic term for wine barrels, which were being transported from Bordeaux to England. This is a theme for the owners, who count Plumpjack, another Napa vineyard as part of their holdings. Plumpjack also takes its name from the writings of William Shakespeare. Once CADE Estate was created, the new owners brought in their own winemaking team which consisted of Tony Biagi, and Nils Venge. Venge is the consultant. 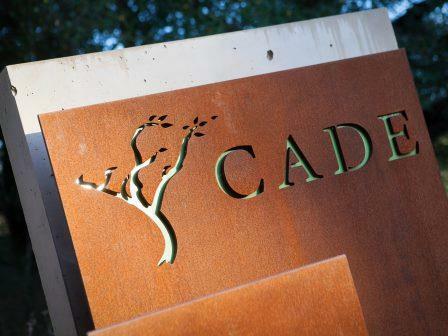 The logo for CADE Estate winery pictures a drawing of the numerous Manzanita trees on the property. CADE Estate Winery owns 54 acres of land on Howell Mountain with 21 acres cultivated with vines. They also purchase additional grapes from other like, minded growers. The vineyards are well placed at over 1,800 feet in elevation, which puts them above the fog line. They have good neighbors as they are not far from Abreu, Adamvs and Dunn. The actual winery is located just before you reach Angwin, if you are driving up the main road on Howell Mountain. Their vineyards are planted to all Left Bank Bordeaux varieties. They have 21 acres of Cabernet Sauvignon, and 2 acres of Merlot. All work in the vineyards is 100% organic. Not only is CADE Estate Winery completely organic, they were the first winery in the Napa Valley to earn the coveted LEED certification status. LEED is short for Leadership in Energy and Environmental Design. The modern, look of the winery and its green design was created by the Architect, Juan Carlos Fernandez. The green, energy efficent design is unique in that it was constructed entirely out of recycled metal, plastic, ash from coal burning plants and concrete. At CADE Estate, they produce 5 wines currently. CADE Estate is best served at 15.5 degrees Celsius, 60 degrees Fahrenheit. The cool, almost cellar temperature gives the wine more freshness and lift. Young vintages can be decanted for 1-3 hours, depending on the character of the vintage. This allows the wine to soften and open its perfume. Older vintages might need very little decanting, just enough to remove the sediment. CADE Estate is best served with all types of classic meat dishes, veal, pork, beef, lamb, duck, game, roast chicken, ribs, hamburgers, barbecue, roasted, braised, grilled dishes and stews. CADE Estate is also good with Asian dishes, hearty fish courses like tuna, salmon, mushrooms and pasta. Sauvignon Blanc, the white wine of CADE is best served with all types of seafood and shellfish, sushi, sashimi, chicken, veal, pork and cheese. Massive, powerful, tannic, full bodied and concentrated. There is intensity of fruit and flavor, a wall of tannin, but the tannins are ripe and polished. The purity of black and blue fruits, jam, smoke, oak are in full force, with length and palate staining concentration. The alcohol is a whopping 15.9%, but there is very little heat found here. In time, this should be an even better wine. Soft, silky, forward and serving up a nice dose of sweet, ripe dark berries, licorice, and dark chocolate. This is medium/full bodied with a really nice, polished, texture and a fruit filled finish. Fresh, spicy, structured with firm tannins, the strong blackberry and cassis profile will be much better after a few years, when it starts coming together. This outstanding wine pops with sweet, ripe dark berries, earth, coffee bean and spice. Tannic, long and clean, this mountain fruit wine demands some time in the bottle before it all comes together.